Here's what I did this weekend. 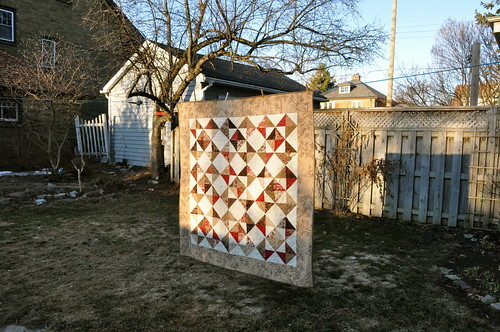 Finished this HST quilt made from two charm packs of Maison de Garance and Bella Moda Snow. I really like this block. It looks great both close up and from a distance. This is not a great photo, but you can see that the back is more French General, either from Rouenneries or Rural Jardin. Thanks to all who left a comment about their favourite old movie on my giveaway post. Popular favourites included Gone With the Wind, Wizard of Oz, Arsenic and Old Lace. I knew most of the ones that people listed, but there were a few that were unfamiliar to me that I want to check out. Especially one with Myrna Loy and Cary Grant, two excellent comic actors. The first winner chosen by the RNG was Cathy, who owns a fabric store. (Not just any fabric store, but Wondrous Wovens, which provides excellent service, good prices and wide selection. 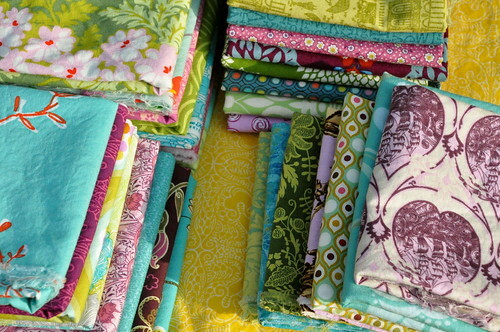 That's where I got my hoard of hard to find Marcia Derse fabrics. 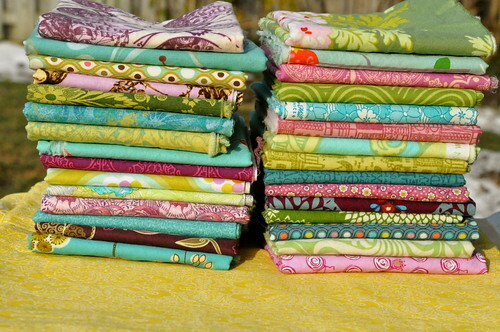 Also, Cathy sells all her yardage cut to order, including fat quarters, which is pretty uncommon, as far as I can tell.) 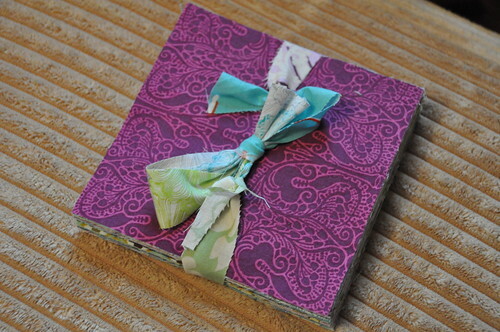 In light of her day job she generously declined the fabric pack, so I picked a second winner: Number 43 is Judith! Judith and I obviously share a passion for Paul Newman in Cat on a Hot Tin Roof. Yay, Judith! I'll pop those charms in the mail to you as soon as you send me your details! Fox!, originally uploaded by Shadrach Meshach & Abednego. Isn't this the cutest? I am a fiend for foxes. I tested this pattern for Joanna who blogs over at Shape Moth. The pattern is available in her online store for download. Here's a slightly closer view. Looking at it now, I wish I had used a deeper contrast for the eyes, and I feel that there is even inadequate contrast with the white. 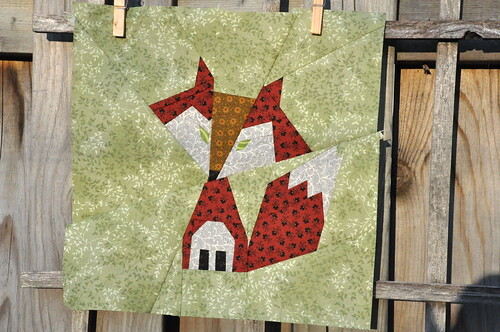 But never mind, overall, I love this little fox. Dresden Plates all pieced, originally uploaded by Shadrach Meshach & Abednego. 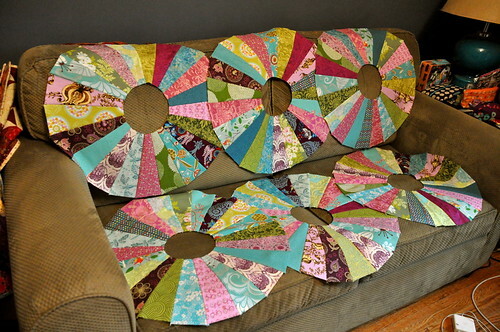 So the Dresden Plates for the Lily's Quilts QAL are all pieced. I thought this might give a better idea of the scale of these plates. They say that if you are trying to lose weight you should use a dessert plate instead of a dinner plate. Wonder how much you would weigh if you used plates this size? So I'm ready for the next step, which is meant to involve piecing these plates into the frame. Mine are a bit smaller than the standard, and apparently there are quite a few folks whose blocks are not the size to fit neatly into template for the corners. Lynne says she will post directions for drafting our own corners. 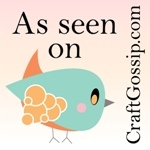 I will watch and wait - perhaps applique will be the way to go. Stay tuned! If you like the fabrics I used for these blocks, you may be interested in this pack of 5" charms that I cut as I went along. There are about 25-30 squares here. I cut a pack for myself and a pack to share. Happy to send them out to someone who tells me the name of their favourite old movie - older than 1960 - by Friday the 25th. Mine has got to be Singing in the Rain! I can't the embedding code for this, but go here to see my favourite scene: the dance number with Gene Kelly and Cyd Charisse in that green flapper dress! Giant Dresden Plate, originally uploaded by Shadrach Meshach & Abednego. No kidding - this Dresden plate measures about 25" in diameter. Wow! I'm a fan of giant blocks - they come together so fast! Six of these will make a quilt 60 x 90". 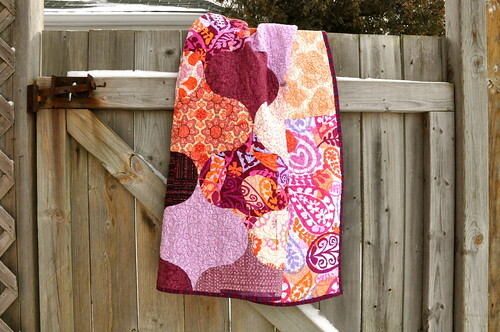 Fancy a Quilt-A-Long?, originally uploaded by Lynne @ Lilys Quilts. 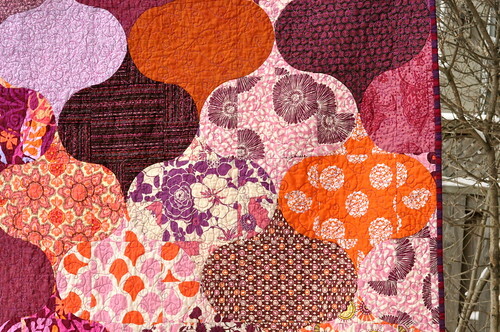 I'm not really anti-social, although it seems like I have been, since I have joined in no bees or quiltalongs in 2011. 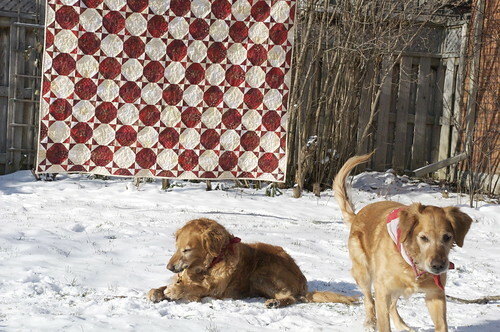 I do enjoy quiltalongs, and I've been keeping my eyes open, but haven't seen anything that really appeals to me. While I really enjoy the camaraderie of working on a project at the same time as many others, I only want to invest the time in something that I think I will really like. (Although I know it can't be the case, I feel like the only person on the planet who doesn't like that Single Girl pattern that is all the rage.) 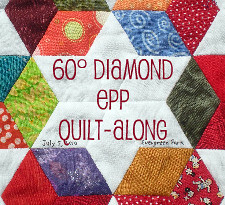 But just recently I read that Lynne at Lily's Quilts is starting a Dresden Plate quiltalong. Normally, I don't like Dresden Plate blocks. But this one won me over because the ends of the blades are flat, rather than round or pointy. I am surprised that this makes such a difference but it does. 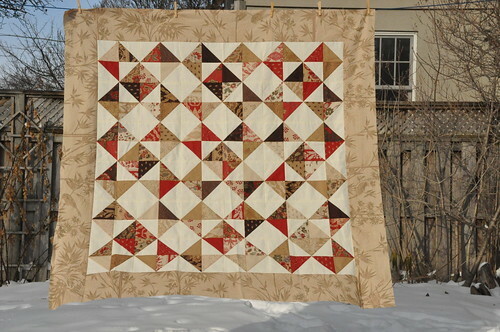 But what really charges me about this QAL is that the blocks are a honking 30" square. I adore the look of oversized blocks, and I've been longing to make something really GIANT - seems like this will fit the bill. 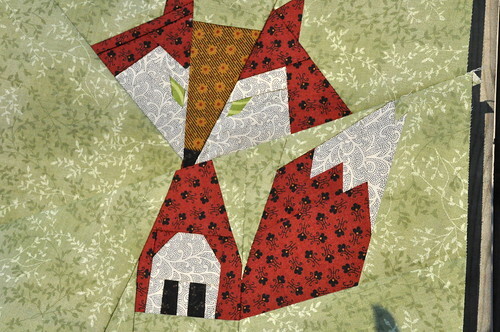 Interestingly, this block has the plate set in to the background rather than appliqued on top. I will wait and see how it goes before I commit to that - I may just fall back on the old-fashioned "stitch it on top" approach if it looks like people are having trouble with the curved seam. 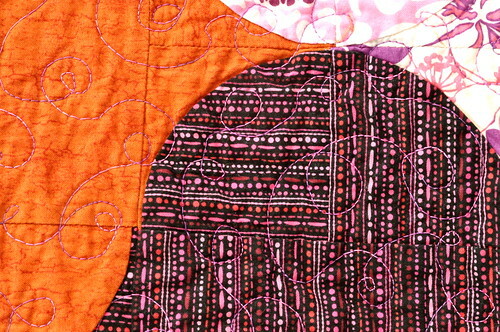 Although with I Dream of Ogeenie under my belt, I should be a curved-seam pro. After working with the subdued tones of Maison de Garance, I am ready for some vibrant colours. 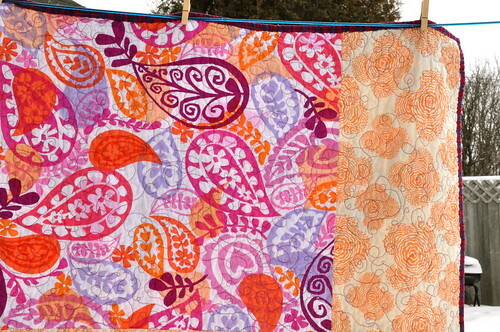 Here are the fabrics I've chosen for the QAL. The yellow (Art Gallery Lace Elements) is to be the background. I will either go for a four- (60" square) or six-block (90" square) construction. 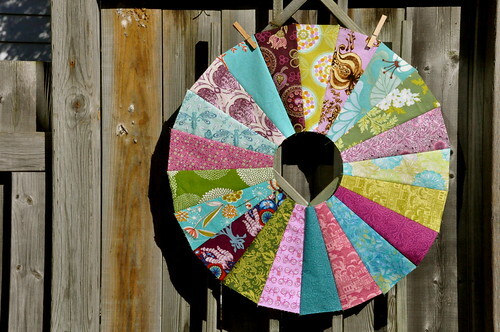 If you're interested in Lynne's QAL, visit the Flickr group where folks are posting their fabric choices and find the links to the templates. Some keeners have jumped ahead, but in the main, things haven't really hotted up yet. A few months ago I was talking to my buddy, Jennifer, and I said that I had discovered the most awesome gadget that had made my hand-sewing life a dream. Of course I was talking about the Clover desktop needle-threader, which I bought in the summer. It sits on the table and you plunk the needle in the little hole on top, eye first, and then press the lever shown here on the right. Some magic occurs inside that little plastic, purple device, because when you take the needle out, there is a little loop of thread stuck through the eye, and you can just pull it through. Not only that, but it has a thread cutter built into the side, which means you don't have to worry if the TSA folks will take your scissors away during airport security checks. After she finished scoffing at me for being the last person in creation to find out about this, Jennifer agreed that it was a pretty fantastic notion. But, she said, hers only worked about half the time. I was sorry for her, because after months of use, mine worked perfectly all the time. Until, one day, it didn't. I can't explain what happened. It just up and stopped being reliable. I insert the needle, line up the thread, and press the level for all I'm worth, like a dang lab rat trying to release a piece of kibble! I can press the lever 20 times, and on the 21st time, it will thread. Or it might thread perfectly on the first try (although this is increasingly rare). I bought another one when I was in Toronto. It was an utter dud from the start. Then, most recently, when I was cashing in the gift certificate I won from my LQS, I picked up a third one. This time, I got a yellow one to change my luck - the first two were purple. I was blissfully happy with it for about a week. Then it started to fail. Now I have two purple and one yellow Clover desktop threaders sitting on the table by my couch, and I can't rely on a single one of them. What the heck is going on with these things? I went online to see if I could find anyone else singing the blues, or perhaps someone had posted a tutorial about how to fix their *$&@^%$ Clover threader. But no such luck. I know there is a simple, low-tech answer to this problem: go back to the old-fashioned manual needle-threader where you stick the wiry bit through the eye of the needle to pull the thread through. But I have been so seduced by the ease of the Clover when it works, that I'd love to find a fix. Anyone? 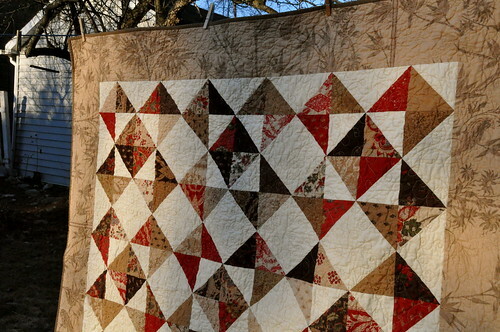 Indeed, this is completely different from the quilt I posted about yesterday! 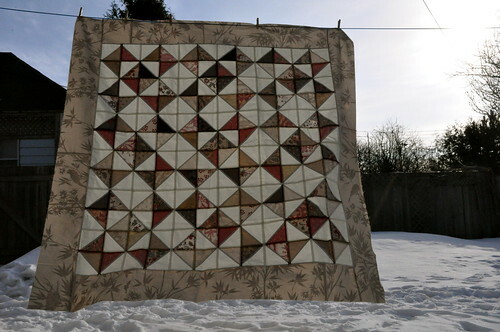 This is a simple quilt made from charm packs - I used two charm packs of Maison de Garance and two of Bella Moda snow, with a border from a Rouenneries print. It went together very easily - the hardest part was trying to settle on a layout, since HSTs can combine to form a near-infinite number of blocks. Even more than I had ever considered, before I had a look at my second-hand bookstore score described here. The one I finally picked wasn't even in the running when I asked for your help back in December. I'm making this for a friend who's had a really horrible year. She doesn't read this blog, and I hope it will be a pleasant and comforting surprise for her. 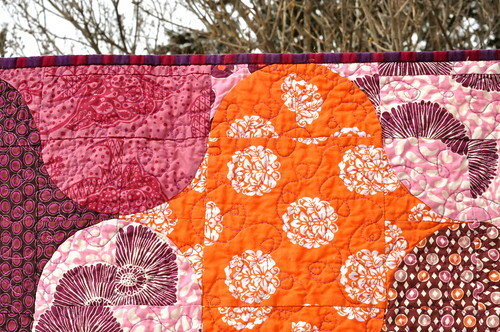 She truly deserves something much more substantially nice than a quilt, but we do what we can, right? On another note, this is International Women's Day, so I thought I would leave you with this short vidoe. The message is sobering and not to lose sight of, but you get to see Daniel Craig in a dress. Does he have nicer legs than you? They're certainly nicer than mine! Appears to be a stunning quilt show upcoming in at the American Folk Art Museum in New York that features red and white quilts. I love this colour combination! I wish I could get down there to see the show, but it is not to be. 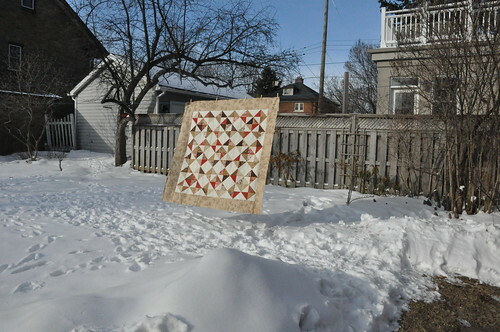 Instead, I am entering my red and white snowball quilt from last year in Taryn's online Red and White Quilt Exhibit for all us travel-challenged bloggers. 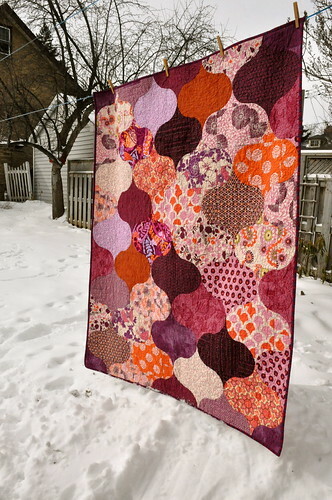 I made this quilt, which I called Red Hots, in the fall of 2009 as part of the scrappy snowball challenge organized by Allyson and Nicole. 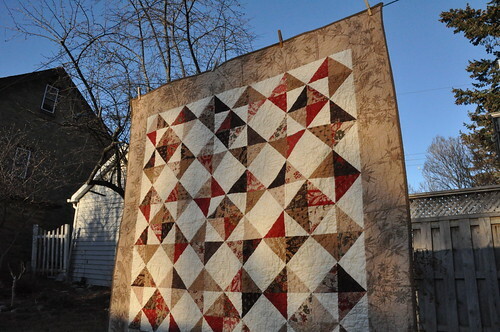 It is batted with wool and backed with flannel, and as a result is the toastiest, coziest quilt going. 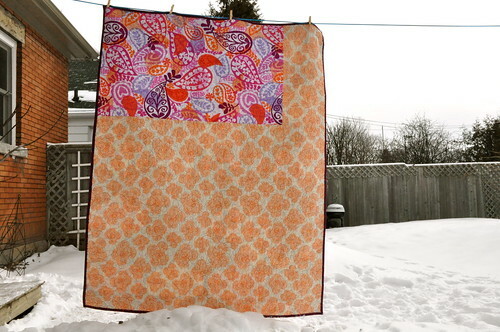 It is my favourite cold weather quilt! 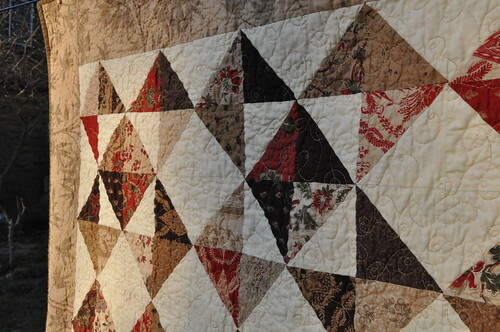 The actual quilt show in New York features 650 American red and white quilts from the collection of Joanna S. Rose. 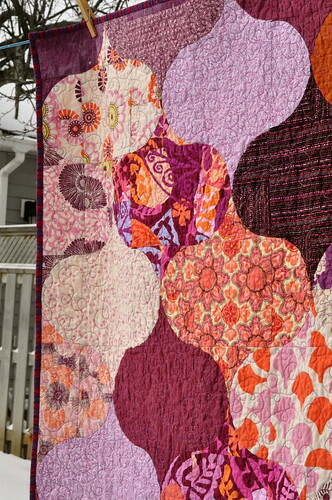 Can you imagine collecting so many quilts in the same colours? 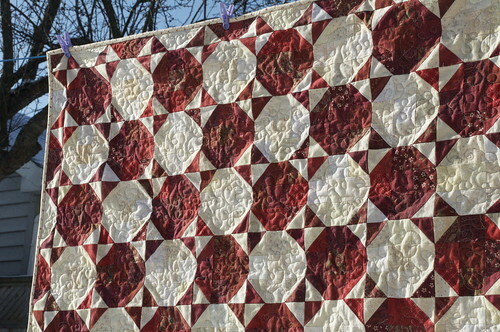 Not I, although there is something very special about a red and white quilt. 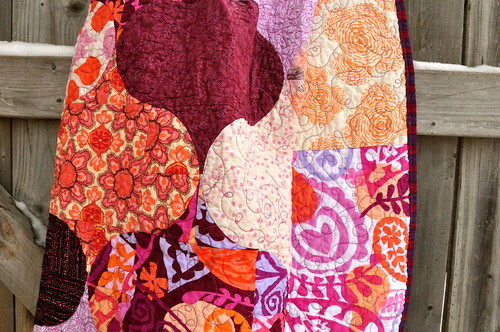 Those of you who are long time readers of this blog will find this post old news, since you've seen this quilt before. However, I have been busy this weekend, and I do have a couple of exciting finishes to share. I'm just waiting for a day without rain to get out and take some photos, so stay tuned! 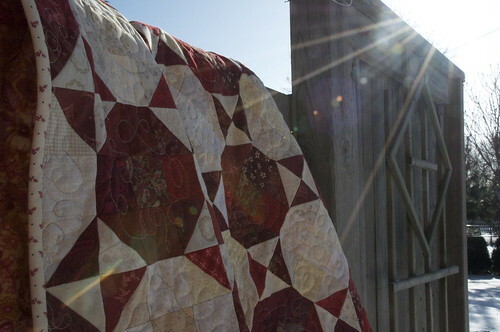 And in the meantime, go see the red and white quilts that have been posted in Taryn's exhibit! And post your own! 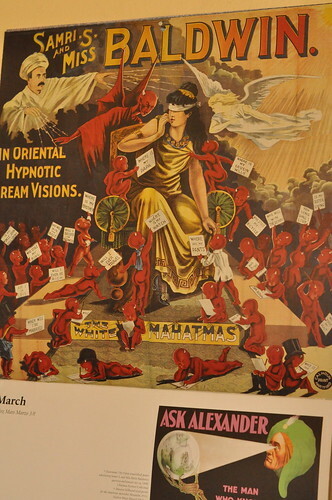 I took this photo off our 2011 kitchen calendar, which shows vintage illustrations of magicians and psychics. I loved this little devil holding up his question to the clairvoyant, and I admit that's how I've been feeling lately. I spent the last week at Vanderbilt University, preparing for a grant application with a colleague, and my head has just been a-spin with that and other non-sewing related things. I managed to leave my very expensive Bose noise-canceling headphones in my hotel room when I left for my 6am flight. Fortunately, the hotel found them and is returning them to me, at my expense, of course. I figure it's just a matter of time before I am asking "Where are my pants?" While I was in Nashville I did have a bit of time to myself. I made a trip to Textile Fabric, which is a very nice but supremely expensive fabric store. 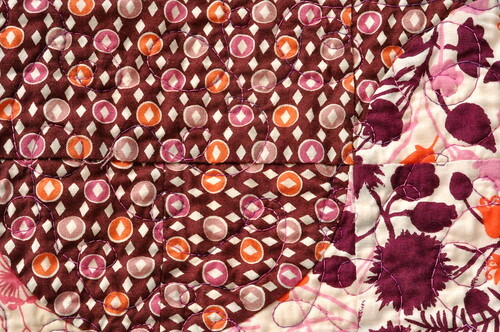 For example, Echino linen/cotton was going for $29 per yard - yikes! Cotton yardage ran for around $12-13 per yard. 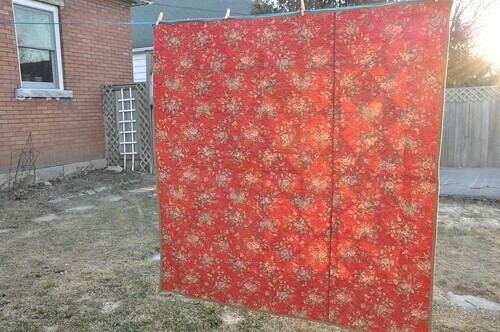 I did get a bit of fabric that I haven't seen in Canada, but I didn't use the budget I had allotted. At that price, I didn't feel the need to stock up. I found an amazing used bookstore in Hillsboro Village, where I picked up a couple of quiltish books. 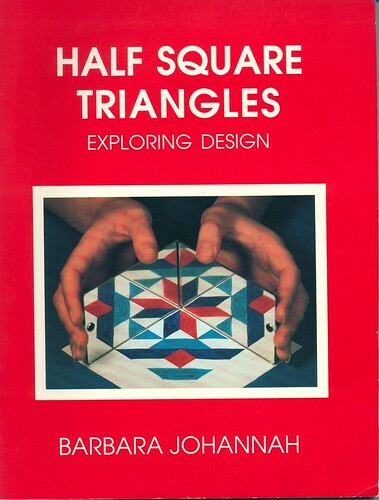 The first one was this HST book from 1987. 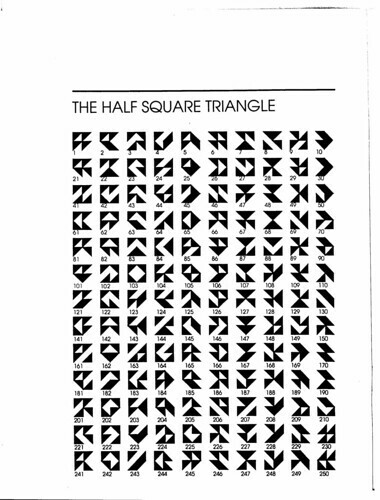 Interestingly, it is based partly on The Sense of Order, the 1704 book by the French monk Dominique Douat, who figured out all the possible combinations of light and dark half-square triangles. This book has an interesting adaptation of this infinite permutation. 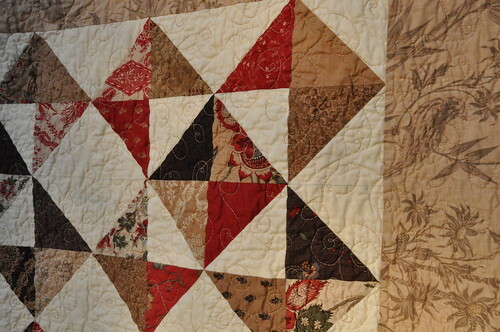 Here is a page where four HSTs are assembled to show many different combinations. I thought it was interesting how the author talked about making personalized blocks based on a numerological adaptation. For example, if your birthday is October 3, 1985, you might make a complex block using blocks 10, 3, 19 and 85. 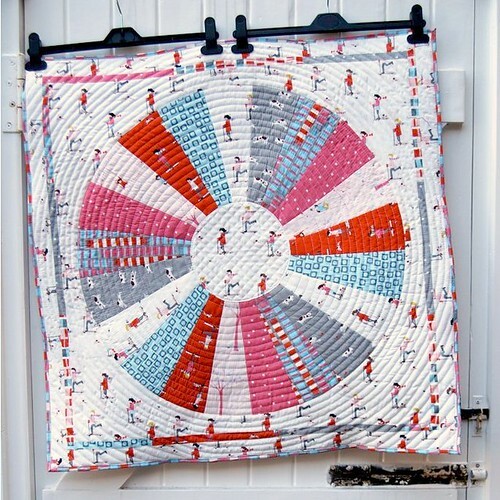 Imagine making a HST quilt that was all a top secret coded message! 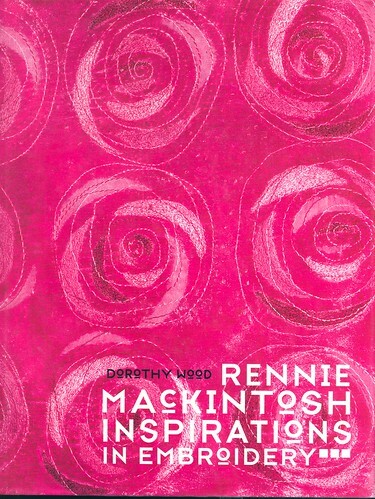 I also bought this book on needlecraft inspired by the work of Rennie Mackintosh. Gorgeous photos and some great inspiration for applique made along the lines of that Tile Quilt book that came out last year sometime. 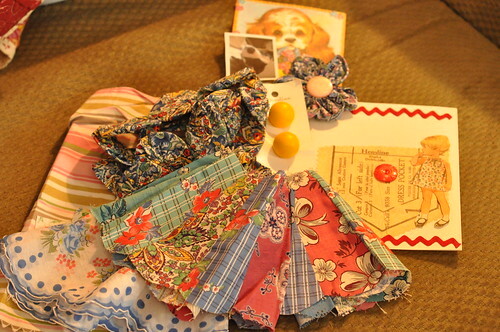 When I returned home, I found a great lot of loot from Sherri, to whom I had sent some giveaway swag a few months ago. Look at this pile of vintage buttons, Dresden plate segments, yoyos,etc. What you can't see, because I piled other stuff on top, are a couple of issues of The Workbasket, one from 1958 and one from 1970. Great stuff! Before I left, I dropped my machine off for cleaning and routine service. I can't wait to pick it up and get to work!